In the world of creativity, if you're not starting a fire, then what's the point? So, we've created a portal to celebrate the most revolutionary and thought-provoking ideas we're seeing in the world today. Some are ideas we've recognized from others and we're tipping our hats to, and others are ones we thought of (go figure). Either way you cut it, you won't find a dull moment here, and hopefully we've inspired you to start your own fire. Marketing companies have been competing for the minds of millennials fiercely over the last few years – and for good reason. Millennials represent about a quarter of the entire US population, and have over $200 billion in annual buying power. Though they have less discretionary income than Baby Boomers and older generations, they have a lot of influence – and are hard to reach with traditional marketing methods. But are millennials still the hottest consumers out there? Or should we be focusing our efforts on a new generation of consumers? Here’s the scoop. Millennials are defined as individuals who were between 18-34 in 2015 by the Pew Research Center. They are just now entering the prime of their lives as consumers. As millennials age, their income continues to grow as a generation. Most millennials are now out of college and working in professional careers, and millennials are the most educated generation to date. This means that the buying power of millennials is only going to grow in future years, as they begin to start families and earn more discretionary income. However, millennials will not stay at the top of the heap forever. As time goes on, Generation Z continues to grow – and a new generation of consumer is born. Generation Z is defined as the “post-millennial” generation. While most definitions vary, it’s agreed that most Gen Z individuals were born around the year 2000 or later. This generation already makes up 25% of the population, and is forecasted to continue to grow. As Gen Z becomes older, and younger people begin to enter the consumer market, they are likely to become the most highly sought-after consumer generation, just as millennials were before them. 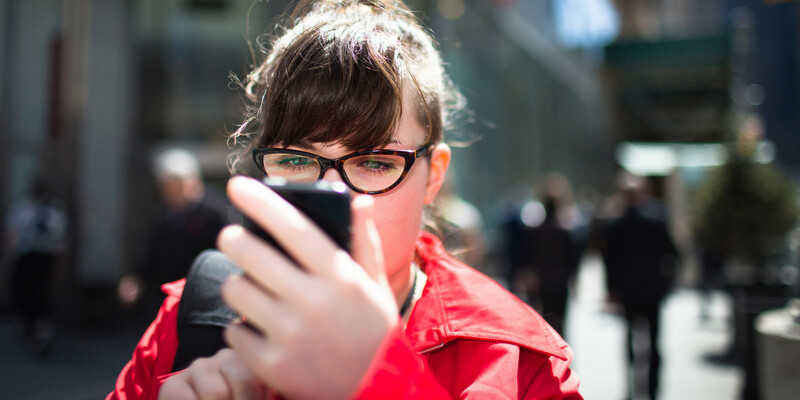 Focus On Millennials In Marketing Efforts – But Don’t Forget About Gen Z! How should brands market their products? Luckily, millennials and Gen Z both share a few common attributes. 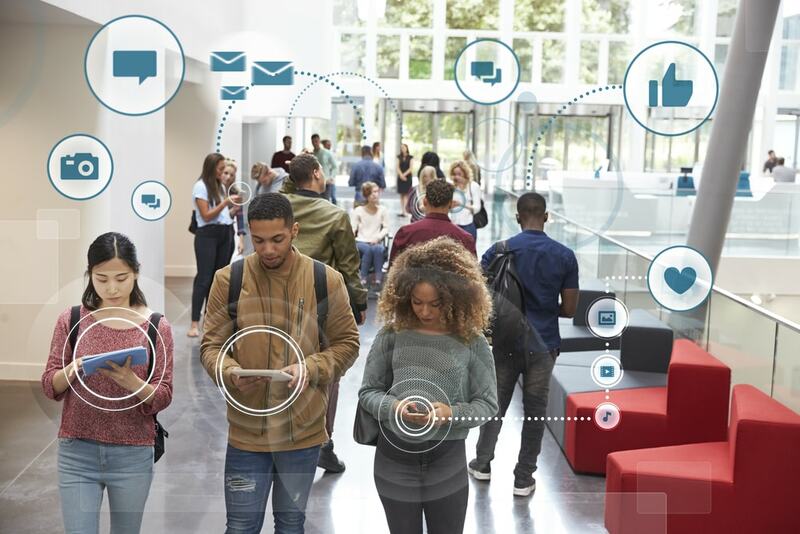 Consumers from both generations are tech-savvy and have quite a bit of influence on the market – and both Gen Z and millennial consumers do not respond well to traditional advertising methods. While millennials should be the focus on most marketing efforts, Gen Z should not be overlooked. Brands should be using social media platforms like Snapchat, Instagram and Twitter to reach a younger audience, and should always be on the lookout for hot trends that could appeal to Gen Z consumers. As time goes on, millennials will become less important as a consumer audience, and the importance of Gen Z will grow. So focus on millennials for now, but don’t forget about the younger generation. If you live in a major metro market, then you know what it’s like to walk down the street and see 90% of the people with their heads down buried in their phone. I was one of those people, until I found myself standing in the middle of the street in Manhattan writing a text and nearly getting hit by a taxi. From that point on, I made sure that I was always looking up. But I am definitely in the minority. And this post is not about the safety, or lack thereof, when it comes to texting. It’s about how marketers can capitalize on this Head Down Revolution. According to Statista, the U.S. mobile phone penetration has reached 81%, representing 223 million consumers. And those consumers spend an average of 4.7 hours per day glued to their smartphones. More importantly, is the role that texting now plays in our everyday lives, especially when it comes to marketing. For an eye-opening example, texts have a 99% open rate compared to 20% for email*. Pretty amazing, huh? Now I imagine that smartphones are currently in the midst of fine tuning their hardware to introduce features that can block such correspondence. But who knows when that will come? So until that day, marketers have a humongous opportunity to take advantage and focus their outbound efforts on the behaviors of the smartphone user. A behavior that is now second nature, and while receiving a text from a brand may seem like a nuisance at first, it is certainly less of one than an email. Also, if you’re sending info or content that isn’t selling, but more serving them something of value, then you’re more likely to be able to maintain that dialogue. And isn’t a dialogue what we want? It opens the door, and leads to traffic. And when you have enough traffic, ultimately it will lead to transactions. It’s this approach to marketing, partnered with the aforementioned tactics, that can build the awareness and engagement you’re looking for. Now how about a little “social experiment”: The next time you’re walking down the street, take note of how many people’s’ heads are down. It truly is a sight to see. Just think, those eyes could be engaged in your brands message. And if the message is “timed” to when your customer is in the market for a new product, it becomes relevant and timely — a very powerful combination. Everyone is talking about wearable technology. In fact, Apple announced yesterday the release of its most anticipated product: the iWatch. 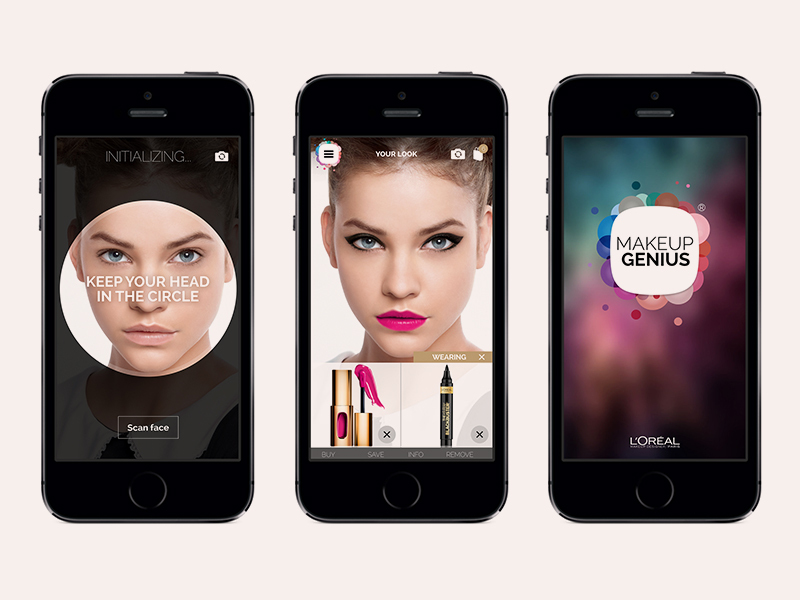 But, in beauty land, L’Oreal is leading the conversation with augmented reality technology in its new app Makeup Genius, taking the way we look at beauty and cosmetic application to the next level. The app took over 10 years to develop and uses an exclusive RT Track 64 facial-tracking-algorism to deliver the most precise facial recognition through a live mirror camera. It allows you to see what you really look like with certain shades of makeup on in real-time as you turn your face, change your facial expression and take various angles. So, if you ever found yourself trapped in the makeup aisle at a drugstore for hours trying to figure out the perfect shade of lipstick, blush, eye shadow or eyeliner and end up covering every square inch of the back of your hand with different colors, you will love this app. Simply put, you can now test out the colors virtually and make your purchase without having to go to the store and make your hands look like a palette. What Sparks Our Fire: A free makeup app using the latest augmented reality technology to help save time in your search for the perfect makeup shade. Have you tried Makeup Genius? Share your thoughts! While there are a number of things you can do to find the cheapest airfare, timing is everything when it comes to getting the best deals. Hitlist is a mobile app that knows when it’s least expensive for you to book a flight to your pre-picked destinations, saving you the trouble of regularly checking travel websites. So, if you have a bucket travel list, but also a budget, Hitlist will keep tabs on travel search engines, notifying you when it’s the best time to fly to any of your selected locations. For example, you can create an alert that notifies you if/when flights to Buenos Aires are listed at $650 or less. Among other customizable features, you can pick the best airport for your travel needs, make your Hitlist public or private, and specify if you’d like to travel only on weekends (or whenever). And there’s also a cool world map to show you all the places you plan to go to or have visited already. What places around the globe would you save through Hitlist? As the sharing economy continues to grow at a rapid pace, new ways of renting different types of property are developing and evolving. This enables the consumer to avoid spending significant amounts of money on items they may only use once or very sparingly. Mootch – a platform for on-demand peer-to-peer and business-to-consumer renting of everyday goods with delivery and pick-up – has finally invented a way to make renting simple and safe. So, for example, if you have electronics, appliances or designer items that you seldomly use, you can make extra cash by renting them out to others. And the same goes for when you’re in need of an expensive device, mode of transportation or appliance that you may only be using for a couple of days, but don’t want to buy. Someone in your area probably has one you could rent. Like many other mobile apps in the sharing economy, you can make money by safely and securely renting out your own stuff as well as cut expenses by renting when you need to do so. 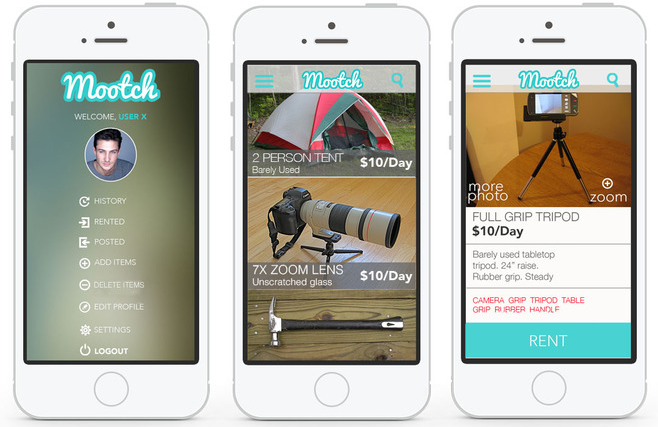 What items would you rent through Mootch?